When you log in to your Parallels business account, click on Business Profile at the top right corner. Switch to the Users page and click on Invite Users. 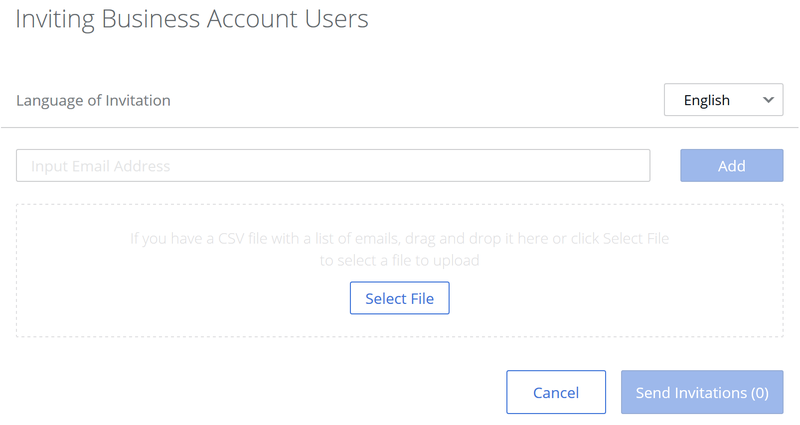 Input email addresses of the users you would like to invite. Note that you can import data from a CSV file if you have one. If you need to delete some of the imported accounts, click on the cross sign next to them. Note that you can also select the language of the invitation email. Click Send Invitations when the list is ready. When the invitations are sent, you will see a confirmation. The invited users will receive an invitation email with a link to join the business account. Please note that you can resend invitations. Mark the email address you'd like to resend an invitation to, click on Actions and then on Resend invitation. On the Users page, check the checkbox next to the account you'd like to remove, click on Actions and then on Remove.